Bert Verdonck, Genius Shortcuts, Extreme Efficiencies, Lifehacker & Life Coach, Create, Connect & Contribute. Enjoy Every Day! Bert Verdonck brings you 17 Genius Shortcuts to transform the way you work! A practical audio-guide for thos who want to master the magic of technology. Bert explains how to shorten your working day by 2 hours! Enroll now for a FREE Genius Shortcuts E-course! Bert shares 7 of his genius shortcuts for FREE! They will boost your efficiency immediately! Enroll now! Before another year goes by, I almost forgot to mention that I got another book published: The Power of LinkedIn! It is my latest book together with Jan Vermeiren. This book is also very unique, because it is published with one of the biggest publishers in the world: HarperCollins and more specifically HarperCollinsIndia. Why? This book is specifically written for the Indian market! Professionals in India make up the largest group (after the USA of course) on LinkedIn. We are using examples of local Indian businesses and tailored all practical elements to the Indian market. Enjoy! 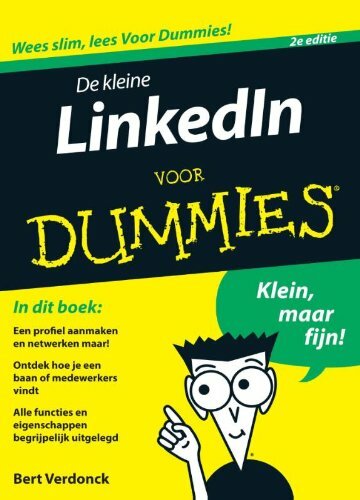 Yes, this week my newest book was launched: the “Little LinkedIn for Dummies” or “de kleine LinkedIn voor Dummies” as the official title in Dutch is called. It truly is an amazing pocket full of tips and tricks to get started with LinkedIn. Where to buy it? Managementboek.nl, bol.com, Amazon and probably most bookshops in Belgium and the Netherlands. How much? Only 8.95 Euro for the printed version or 5.99 Euro for the e-book. If you have read the book, kindly provide a review on any of the above sites or drop me a line. Thanks! The second edition of TEDxGhent takes place on Saturday, June 16. TED stands for Technology, Entertainment & Design. In the spirit of “ideas worth spreading”, TED has created a program called TEDx. TEDx is a program of local, self-organized events that bring people together to share a TED-like experience. The program is designed to give communities, organizations and individuals the opportunity to stimulate dialogue through TED-like experiences at the local level. And now for the second time, this experience is coming to Ghent. At the TEDxGhent event, TEDTalks video and live speakers will combine to spark deep discussion and connection in a small group. This year, the TEDxGhent tagline is ‘Meeting of Minds’. All speakers will share their passion and vision, spread over three thematic blocks: ‘city and nature’, ‘body and mind’ and ‘work and life’. TEDxGhent wants to establish a genuine ‘Meeting of Minds’, both by introducing new and groundbreaking ideas and by offering the audience and the speakers the opportunity to engage in a constructive dialogue. Next to the fact that I really LOVE the TEDTalk videos, I am also very pleased to share that I’ll be a speaker at the TEDxGhent event. Indeed, I’ll share a couple of my lifehacking skills and Genius Shortcuts: Smart in Business, Fun in Life! So, if you are ready for a (full) day of inspiration and connecting with likeminded people, this event is for you! More info? Check out the TEDxGhent website before it is sold out! PS : Did you know that Ghent is one of the most beautiful cities in Belgium? (or it is crossing over 😉 ) to the UK. With our bestselling programme “How to REALLY use LinkedIn” I am now preparing for launching in the UK. Together with REV Sales, probably the best sales team ever (I will keep you posted! ), we are excited to learn companies and organisations in the UK to show them how to harness the power of LinkedIn to generate more sales and to find new colleagues more effectively. If you are interested in how this works for you and you are in sales? Contact us to get an invitation to our exclusive VIP launch event! If you are interested in how LinkedIn saves you a lot of money in recruiting and you are in HR, corporate recruitment or staffing people? Contact us to get an invitation to our exclusive VIP launch event! If you are interested in hiring me as a speaker for your event, conference or an in-company training, get in touch too! By the way, did you know that LinkedIn now has more than 8 million users in the UK? Time to learn how to really use LinkedIn, right? Oh, if you haven’t heard yet, together with Jan Vermeiren, I am giving away 1 million copies of our book “How to REALLY use LinkedIn”. Just go to our website to download it for FREE! give away 1 million books for FREE! The Association of Transformational Leaders, Asia (ATLA) organizes the inaugural event, the Transformational Leadership Summit, which will take place in Bali, Indonesia from October 13th to 16th 2011. This event will be attended by Global Thought Leaders, Change Makers and Social Entrepreneurs: Individuals that are playing a transformational role in addressing the grand challenges of humanity (Attendance is by invitation). The purpose of this summit is to bring together Transformational Leaders from various fields and many countries, to connect with each other, share experiences, create potential new partnerships and gain a new perspective for the common path we are sharing as a global community. Many of the attendees will be giving 20 minute action talks on their area of experience and expertise. Along the lines of a TED talk, these will be high-impact recorded sessions. Each will be oriented around key learnings and actions, and each will also have a Q&A section. As you already guessed, Bert Verdonck will be participating in this Transformational Leadership Summit in Bali. We are giving away 1 million copies of the international bestseller "How to REALLY use LinkedIn"! Follow the advice of 2 authors who have helped hundreds of people create their books and see your book come to life in just 100 days. Order "Your Book in 100 Days" now! Bert is currently in Belgium and The Netherlands. If you want to book Bert, get in touch now! For more info on trainings, workshops or presentations, visit Networking Coach for Belgium & the Netherlands or Really LinkedIn for the UK and internationally.